HUNTSVILLE, Ala. — Minor penalties come with power plays that last exactly two minutes of game time. No more, less only if a goal is scored by the team with the power play. Anybody who has been around the game, however, will say the power play doesn’t truly end until the penalized team regains control of the puck. Hampus Eriksson’s game winner Saturday night is not on the books as a power play goal. But, with the goal coming just four seconds after the expiration of a penalty, the argument exists that it was a power play tally. Lake Superior (4-0-0, 2-0-0 WCHA) needed a two goal third period to rally past Alabama Huntsville (0-8-0, 0-2-0 WCHA) in the second game of their weekend series, picking up a series sweep in the process. The Chargers, who are hungry for their first win of the season, struck first early in the second period on a goal by Jack Jeffers. The freshman potted his second goal of the season on Lakers goaltender Mareks Mitens, who earned the start from head coach Damon Whitten. With the shots close to even after two periods (18-17 in favour of the Chargers), Alabama Huntsville, in front of a home crowd of 3083, came out firing away at Mitens in the final period. The native of Ventspils, Latvia, made several big saves to keep his team in the game. Lake Superior found the back of the net just past the 7:00 mark of the third period when Anthony Nellis connected for his third goal of the season. Assisted by Gage Torrel and Eriksson, the Breakyville, Quebec native got in all alone on Sinclair and now has five points (3-2—5) so far on the season. Looking for the go ahead goal, the Lakers got their chance when Bailey Newton was called for interference with 9:46 to play. While the 2:00 power play itself yielded no goal, one was scored by Eriksson just after the penalty expired and before the Chargers could gain control of the puck. Holding down the fort, Mitens and the Laker defense held back Alabama Huntsville’s furious effort to tie the game, collecting the 2-1 win in the process. In net, Mitens had 29 saves on 30 shots. For the Chargers, Sinclair came up with 24 saves on 26 attempts. Dating back to last season, the Lakers are 8-2-0 in their last 10 games on the road. The flipside of that, however, is that, in the last 10 home games, Lake Superior is 2-8-0. 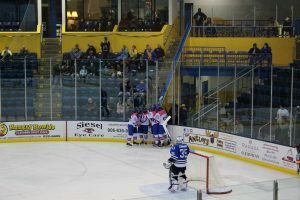 The Lakers will look to amend that this coming weekend when they play host to the University of Michigan. 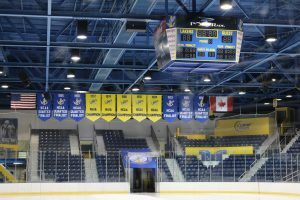 Friday’s game is set for a 7:37 p.m. puck drop, while the Saturday game is at 7:07 p.m.
HUNTSVILLE, Ala. — An oddity that the Lake Superior State Lakers fell victim to in their 2017-18 season finale against Ferris State occurred again in their Friday night matchup against The University of Alabama in Huntsville. This time, the oddity worked out in favour of the Lakers. Alex Ambrosio’s first career goal was the difference maker as Lake Superior (3-0-0, 1-0-0 WCHA) survived a late rally by Alabama Huntsville (0-7-0, 0-1-0 WCHA) in a 4-3 conference win. What makes the game winner by Ambrosio an oddity is that the goal was an empty netter. The Lakers came out of the gate strong, peppering Chargers goaltender Mark Sinclair with 19 first period shots. Sinclair was sharp, turning aside all but one of those shots. Lake Superior converted when Anthony Nellis intercepted a pass on a penalty kill and found Brayden Gelsinger going the other way. Coincidentally, Gelsinger’s second goal of the season was also the second shorthanded goal for Lake Superior this year. Alabama Huntsville’s offense did a much better job of generating shots in the second period, equaling the Lakers’ 9 shots in the middle frame. The Chargers tied things up on an early power play goal when Tyr Thompson took advantage of Lake Superior’s Ashton Calder sitting in the box for tripping. The goal sent the teams to the dressing room after 40 minutes tied one apiece. The third period saw the Chargers, who were looking to get in the win column for the first time this season, outshot the Lakers 15-7. 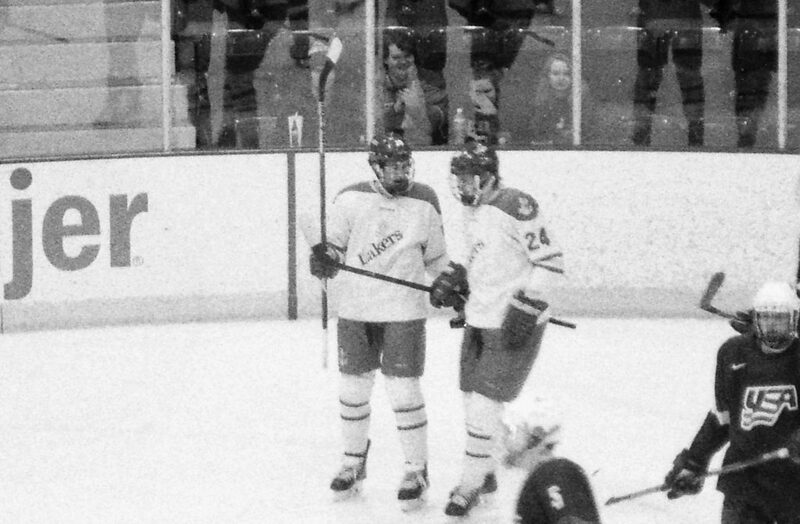 It was the Lakers, however, that found the back of the net first when the Lakers’ alternate captains each found the back of the net. Defenceman Collin Saccoman scored his first of the season early in the period, while Nellis picked up his second goal of the year with less than 8:00 remaining in the game. Their backs against the wall, Alabama Huntsville cut the Lake Superior lead to one with 4:35 left in the game. Brandon Salerno got the puck past Kossoff for his first of the season, making the score 3-2 Lakers. Needing another goal to force overtime, the Chargers pulled Sinclair for a sixth skater. 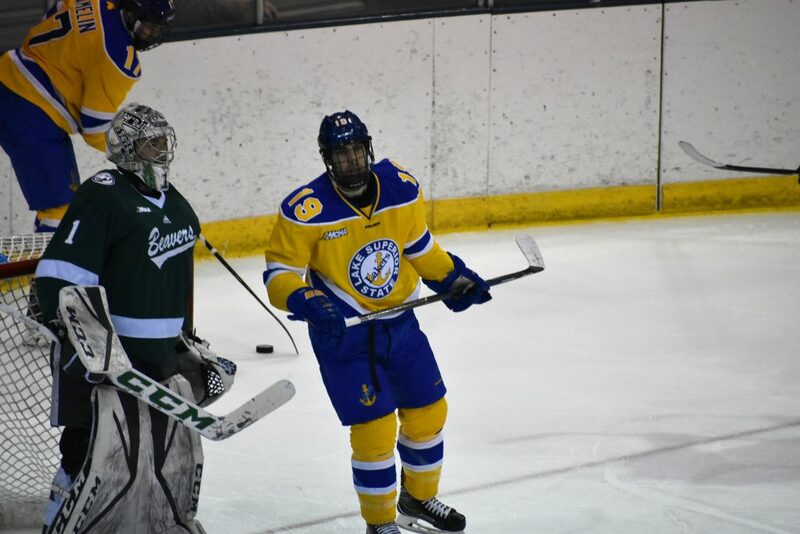 Less than 10 seconds after Sinclair made it to the bench, Lake Superior came up with the puck and Ambrosio, earning his first goal as a Laker, appeared to ice the game with only 1:21 left. 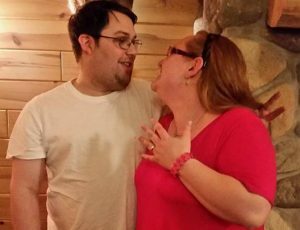 Alabama Huntsville showed their resolve, pulling Sinclair again to try and force overtime. With 22 seconds remaining, Connor James put the Chargers within one and kept his team very much alive. 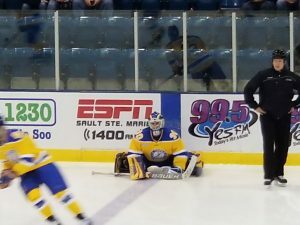 Although they were a goal away from overtime, the Chargers could not gain the zone long enough to pull their goaltender again for another extra attacker. A couple shots by Kurt Gosselin did no harm as the Lakers pulled out a tense 4-3 victory. In goal, Kossoff stopped 25 of the 28 shots he faced, while Sinclair made 31 stops on 34 shots. NORTH ANDOVER, Mass. — And now for something completely different. 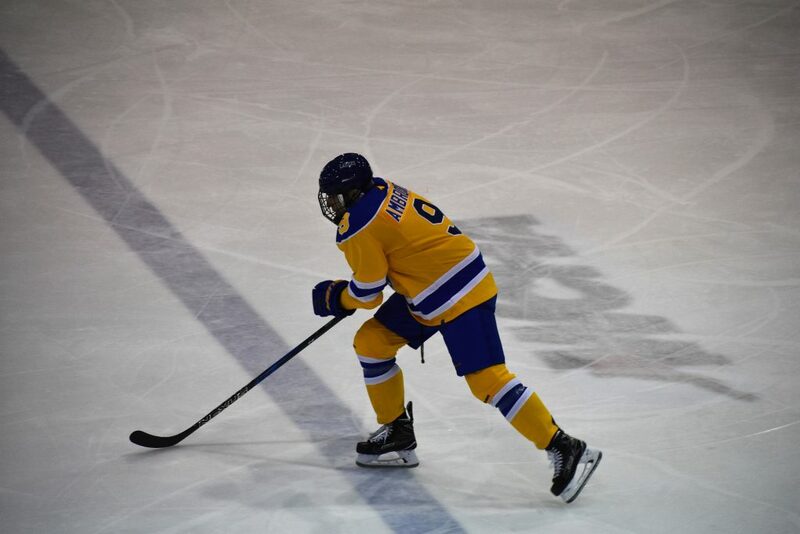 An afternoon after Lake Superior State and Merrimack combined for nine goals, only one goal was tallied for either team, but the Lakers were the squad to come up with the difference maker as they picked up a series sweep with a 1-0 win at Lawler Rink. Owing perhaps to the quick turnaround from the previous day, both teams were sluggish out of the gate. The game started at 4 p.m., about three hours ahead of the typical start time. 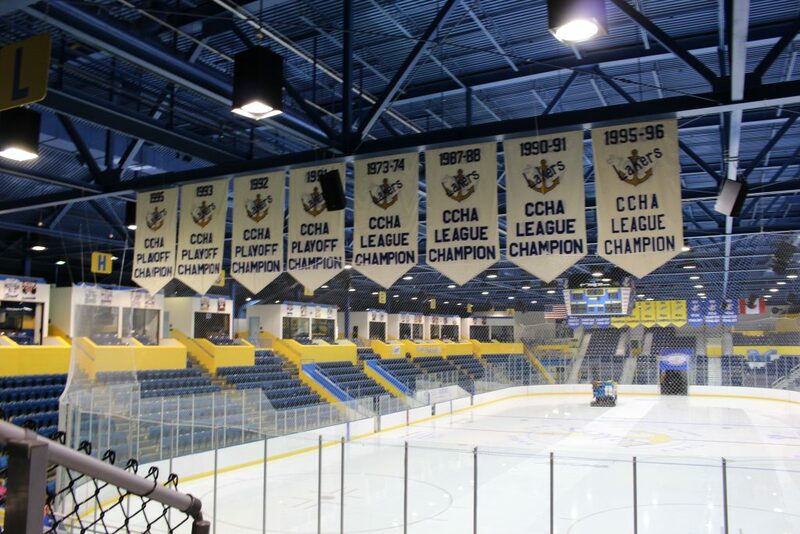 While the Lakers (2-0-0, 0-0-0 WCHA) outshot Merrimack (0-2-0, 0-0-0 Hockey East) 10-6 in the opening period, they were unable to solve Warriors goaltender Craig Pantano, who earned the start from coach Scott Borek in place of Drew Volger, who was victimized five times on just 19 shots. Early in the second period, the Lakers’ efforts cashed in when Max Humitz, who had 13 last season to lead the team, picked up his second of the young season. Nabbing the only assist on the goal was Brayden Gelsinger. Noticeable throughout the game was the steadfast play of sophomore goaltender Mareks Mitens. The native of Ventspilis, Latvia withstood a barrage of shots from the Warriors, who outshot the Lakers 25-14 over the final 40 minutes. As time began to run short, the offensive pressure built for Merrimack, but Mitens held firm, making a few sensational saves along the way. All in all, Mitens stopped all 31 shots he faced for his second career shutout. His first came on February 3rd, 2018 in a 2-0 win over Bemidji State in which he made 36 saves. In the other crease, Pantano took the loss with 23 saves on 24 shots. 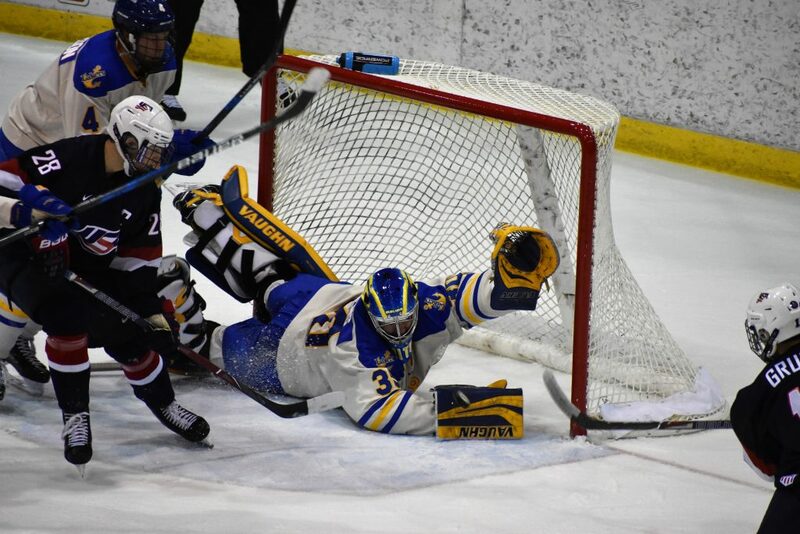 One of two senior netminders for Merrimack, Pantano was sharp as well, taking a hard luck loss. The Lakers open their home slate with a two game exhibition set against Nipissing College. Both games are set to begin at 7 p.m. A special ticket deal is available online only for $3.50 tickets to each game (in celebration of the 350th anniversary of the founding of Sault Ste. Marie).